Our former Dean and Rector, The Very Rev. Bob Osborne, shared these pictures of his canoe trip in June, the length of the Rideau Canal. Bob is blessed to be enjoying good health in his retirement. When Robert Orr looks out at his Kingston Crescent neighbourhood, he feels as if he’s watching it die. The tree canopy where he’s lived since 1995 is withering before his eyes, just one casualty in the city’s battle against Dutch elm disease. “If it keeps going like this, it won’t be the neighbourhood I moved into,” said the soft-spoken, 61-year-old retired teacher. In the area where he lives, hundreds of elm trees have been lost in the past decade. City statistics show that 5,500 trees are lost to the disease each year. When one of Orr’s neighbours moved to Kingston Crescent in 1975, he had 27 elm trees on his property. Now, he has none. Orr and his partner had eight when they first moved to the neighbourhood. This summer, their last tree was infected. “One doesn’t have to be a tree lover to realize there are some very practical concerns here,” Orr said. Dutch elm disease spreads through the fungus carried on the backs of elm bark beetles. They lay eggs in elm trees in the spring, which go on to hatch and mature throughout summer before a new generation is born in the fall. When diseased trees are not removed quickly – ideally during the summer they are infected – the disease spreads. Orr is frustrated by what he views as the city’s lack of political will to shut down the disease. Since the summer of 2016, he says he’s witnessed the city losing the fight. He says not only has the tagging of infected trees slowed down, but so has their removal. Martha Barwinsky, the city’s forester, admits they’ve fallen behind in efforts to remove diseased trees, but says they continue to tag them on schedule. They do the best they can with the resources they have, she says. The city has more than 230,000 adult American elm trees, which makes it the largest standing population in North America. But, Barwinsky says they are at a critical point in trying to protect the city’s tree canopy. Another concern is the arrival of the Emerald ash borer beetle, which isn’t a matter of if, but when, Barwinsky said. The fear is it could coincide with the city battling Dutch elm disease, thus further dividing their resources. If their arrival isn’t properly attacked, it could result in the death of all ash trees in Winnipeg. Once they arrive, she added, they’re here to stay. The city currently has 16 to 20 people working on surveying trees and is rerouting funds from tree planting to go toward the removal of diseased trees. That, in Orr’s opinion, is a disastrous and short-sighted strategy. Orr tries his best to do his part by talking to his neighbours, calling 311 about diseased trees and writing letters to Trees Winnipeg and his city councillor. But he recognizes his efforts are limited and says he often receives no response from authorities. He thinks the city needs to boost funding to the department that fights tree disease. We have planted quite a few trees in the past three or four years, as part of our ongoing reclamation of the Cemetery, where we have lost far too many trees over the years, mostly American Elm, but also some big Maple trees to age; we are continuing this process and you can contribute if you’d like to do so. We are asking for $200 to be given to the Cathedral and we will plant a tree in honour or in memory of the person of your choice. If you are interested please call Carol in the Office at 204.586.8385, or e-mail her at <office@stjohnscathedral.ca>, and she can give you more details; thanks for considering this. NOTE: In the summer of 1817, AFTER signing the Treaty, Lord Selkirk designated land on the west side of the Red River for a ‘Protestant’ church and mission, what is now St. John’s Anglican Cathedral, and on the east side of the Red River, near The Forks, for a Roman Catholic church and mission, what is now St. Boniface RC Cathedral. Both churches were established on land set aside by Treaty fifty-four years before Treaty One was signed at Lower Fort Garry in 1871. “After two years of work gathering stories, writing, receiving feedback, rewriting and testing the material we are extremely excited to share the culmination of our Mental Health is Everyone’s Health project with the world premiere of Breaking Through by Hope McIntyre and Cairn Moore. “The stories of five individuals struggling with mental health issues interweave in this new play. The project saw writers McIntyre and Moore team up with Artists in Health Care, Red Threads Playback Theatre and the Selkirk Mental Health Centre as well as working with multiple community organizations and the public. The resulting play is an exploration of mental illness grounded in real experience. Tom Denton and Hospitality House – Special Dean’s Forum, Sunday, 7 May at 9 a.m.
“A Christian Response to the Refugee Crisis: – a conversation with #TomDenton about the present crisis and the work of Hospitality House Refugee Ministry”. Sunday, May 7, 9:00 a.m., Mr. Tom Denton, Executive Director, #HospitalityHouse, will be with us to bring us up to date on this critical ministry in which we share. There will be time for questions and conversation. Please come and join us, and stay for worship after. All welcome. #HospitalityHouseRefugeeMinistry (#HHRM) is a non-profit organization, and has for many years been Winnipeg’s leading sponsor of #refugees. Thousands have been sponsored from appalling refugee circumstances, into new hope and productive lives in Canada. They continue to flood into our city, and while caring families look after many, others must look to the support of Hospitality House to survive their first year here. Several parishes and individual donors have generously supported the work over the years, but the needs continue to be great, because the refugees keep arriving. Hospitality House, the building, is owned by the Anglican Cathedral Parish of St. John, and is on Cathedral property, beside the Churchyard. The only other staff person, Karin Gordon, is resident in the House, and does amazing work. Jay Dyck is our member of the HHRM Board, and an enthusiastic volunteer and supporter. Thanks, Jay, and also Vic Janzen, for your ongoing energy and commitment! SIDNEY WEBBER On Thursday, April 13, 2017, Sidney Webber died at Fred Douglas Lodge. Born July 19, 1923 at the Grace Hospital to parents, Sidney E. Webber and Rosetta Margaret Webber. Sidney was an only child, spending most of his free time with his family. Sidney grew up in the North End of Winnipeg, residing on Inkster Blvd. as a child and later receiving the home of his parents. His cousin Nancy Webber resides in Victoria, BC. Sidney’s greatest memories as a child were when his Dad worked for CPR and would be given passes to the rail. Every summer his family would vacation to West Minister or English Bay so he could swim in the ocean. Sidney attended Luxton School for grades one to nine, advancing to St. John’s Tech for grade ten and carried on to business College to become an Accountant. He started work in 1942 as an Accountant for Dominion Bronz Company, where he worked for many years until retirement. Sidney loved to golf at the Kildonan Golf Course and was a member of Granada Speed Skating Club for five years and spending many hours in his garden. Thank you to Fred Douglas Lodge staff at Evergreen as well as Rev. Paul Peters Derry for all your care and support. Funeral Service will be held on Tuesday, April 25 at 10:00 a.m. at St. John’s Cathedral Anglican Church, 135 Anderson Ave. with interment following at St. John’s Cathedral Cemetery. With dignity and grace, our family Patriarch, Lennard Washington Sampson, died and was welcomed into the arms of our Lord and Saviour, surrounded by his family, at Seven Oaks Hospital in Winnipeg. Len will be deeply missed by his wife of 59 years, Barbara; six sons, Keith (Debbie), Kirk (Kim), Kerry (Sandra), Kester (Lorelei), Kordel and Kyle; 16 grandchildren, Korbin (Jenny), Kyra (Kyle), Kasandra (Aaron); Terrell, Kayne, Kareem and Kory; Tyler, Terrence and Taylor; Kyle (Joan) and Kayla (Arnie); Kollin (Kaytie) and Matthew, Noah and Owen; 12 great-grandchildren, Kali, Dominik, Melody, Aria, Taliyah, Chloe, Yazmin, Micheal, Vida, Drayden, Maleena and Olivia; his sister Cleorita Ramcharan and her family; sister-in-law Shirley Cooke and her family; brothers-in-law, Sherwin, Jack and Jeff Sheppard (Althea) and their families, as well as numerous nieces, nephews, a large extended family, and many dear friends. Lennard was predeceased by his parents, Sydney and Millicent Sampson; father-in-law and mother-in-law Augustus and Violet Sheppard; brother Livingston Medford; sisters, Ursil Charles, Velda Walters, and goddaughter Sherry Sheppard. Len was born on Christmas Day 1933, in Usine, St. Madeleine, Trinidad and Tobago, the youngest of five children and was educated in San Fernado. He was employed as a machinist with Texaco in Pointe-a-Pierre. In 1968, he along with his wife and five young sons, immigrated to Winnipeg. Len was employed as the General Manager of Cyclo-Chrome Industries and later employed with Dominion Tanners. He was also an entrepreneur and owner of Trin-Tech Industries, and later owned and operated Krystal Crankshaft right up until his passing. Len was an ardent community servant and leader, often referred to as the Captain. He served on numerous committees and organizations including, Cari-Cana, Caripeg, Trinidad and Tobago Society, Barbados Association of Manitoba, Council of Caribbean Organizations of Manitoba, Folklorama – where he served as an adult ambassador, High-Life Steel Orchestra, Independent Order of English Mechanics, Preston Unity, where he was the Grand Master of Canada and a member of the Supreme Council, London, England, and a member of St. John’s Cathedral for over 40 years. Len was a family man, his family was always number one to him. He was also very respected and loved by all who met him. His home was always open to anyone and everyone. His kind and genuine nature, infinite wisdom, sense of humour, his many stories, his guidance and constant words of encouragement will be greatly missed. We are truly blessed to have had him in our lives. Viewing will be held on Friday, March 10, at Cropo Funeral Chapel, 1442 Main Street, Winnipeg, from 7:00 p.m. to 9:00 p.m. Funeral Service will be held at 12:00 p.m. on Saturday, March 11 at St. John’s Cathedral, 135 Anderson Avenue, Winnipeg, conducted by the Very. Rev. Paul N. Johnson with viewing one hour prior to service. Interment to follow immediately after the service in St. John’s Cathedral cemetery. In lieu of flowers, donations in memory of Lennard Sampson may be made to ‘St. 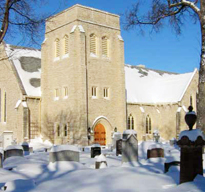 John’s Anglican Cathedral‘, 135 Anderson Ave., Winnipeg, MB R2W 1E2.